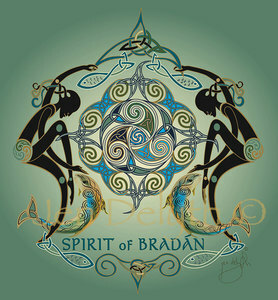 Spirit of Bradan - Bradan Feasa , the Salmon of Knowledge, are the wise, sacred fish of the Celts. They are associated with Aois Dana, the Poets of Ireland. Salmon are inspirational in their courage and knowledge as they journey from the rivers of their brith to the great oceans in a heroic effort to struggle against the rugged rapids and waterfalls to spawn, and then die where they had been born. Bradan is honored as a sacred symbol of wisdom. The wisest and oldest of all the animals was the salmon of Lyn Llyw.